Robotic vacuum that thoroughly cleans the area. Equipped with Three-Stage Cleaning System which can pickup larger debris. Rank: #42 out of 281. Gets under the bed, tables, chairs due to its slim design. 3.6 low profile cleans under furniture, beds, and sofas. The Roomba 618 Vacuuming Robot provides a thorough clean, all at the push of a button. The patented, Three-Stage Cleaning System picks up dust, pet hair and large debris like cereal. The Xlife extended life battery helps your robot go the distance, providing up to 4x the battery cycle lifetime. Roomba 618 is a very popular option on the higher end of the price range. 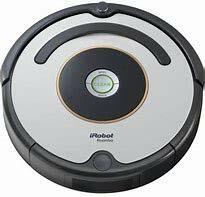 It's in the top 3 bestselling robotic vacuums and has dozens of popular alternatives in the same price range, such as Roomba 665 or bObsweep Bobi Pet . Roomba 618 is $45.10 more expensive than the average robotic vacuum ($249.99).